Sleep apnea is a condition which can often be misunderstood but can be serious. Sleep apnea is a condition which can be misunderstood and furthermore not even be something that those who suffer from it realise that they have. What happens is that people who do suffer from it have pauses in breathing while they are asleep – which is why they don’t know that they have it – and these pauses can last from a few seconds to several minutes. Moreover, this can occur several times during the night. Obviously sleep apnea disturbs normal sleep and as a result sufferers may feel tired or fatigued during the day and wonder why they do. If children suffer from it, there may be hyperactivity as a result or problems in school. Sleep apnea comes in three different types – obstructive sleep apnea (OSA), central sleep apnea (CSA) and a mixture of both types which is simply called mixed. The causes may be a result of being overweight, which is very common, a small airway, enlarged tonsils, a family history of it, and some form of allergy. Certain changes in lifestyle can help and these include stopping smoking (smokers are three times more likely to suffer than non-smokers), avoiding alcohol, losing weight, and avoiding sleeping on the side. If you snore this may very well be an indication of sleep apnea. If your partner complains of your snoring, or you find that your partner snores, it may well be the case that you or they are sufferers. Men are more likely to have the condition than women, although it is known that women tend to snore more after the menopause. If you feel tired during the day, or have trouble concentrating at work this may also be a flag for sleep apnea. 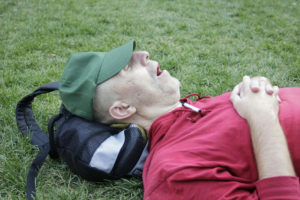 San Francisco sleep apnea surgery can help alleviate the condition in many instances. Orthognathic surgery to reposition the jaws can help considerably. Dr Alex Rabinovich regularly undertakes San Francisco sleep apnea surgery to help sufferers in the city. Of course, it is not always easy to determine whether or not you have sleep apnea in San Francisco, and Dr Rabinovich will work closely with a sleep expert in order to ascertain the extent of the problem. However, the good news may be that oral surgery is not always needed, and the treatment could be as simple as a weight loss plan, an oral appliance used overnight to help with breathing, or a simple outpatient procedure carried out under a local anesthetic. Dr Rabinovich offers all patients a completely free consult, so if you believe that you may be in need of San Francisco sleep apnea surgery simply contact the office on (415) 817-9991 to make an appointment.